Here are some photos and videos of recent activities at the New Dawning school. San Juan La Laguna is a village of 5000 on the shore of Lake Atitlan, in the mountains of southwest Guatemala. TO ENLARGE A PHOTO GALLERY, CLICK ON ONE OF THE PHOTOS IN THE GALLERY! Traditional clothing and ceremonial outfits are important to the Mayan culture in San Juan La Laguna and all communities of the lake. VIEW OUR VIDEO TO SEE MORE PHOTOS AND VIDEOS OF OUR SCHOOL AND TO GET MORE INFORMATION ABOUT SPONSORING A CHILD. SCHOOL OLYMPICS are sporting events that are held each year, and all of the school in town participate in events like soccer, basketball, swimming, running, chess and volleyball. It is a great week of fun for all. Work was started on the new administrative offices for the school in June of 2017. 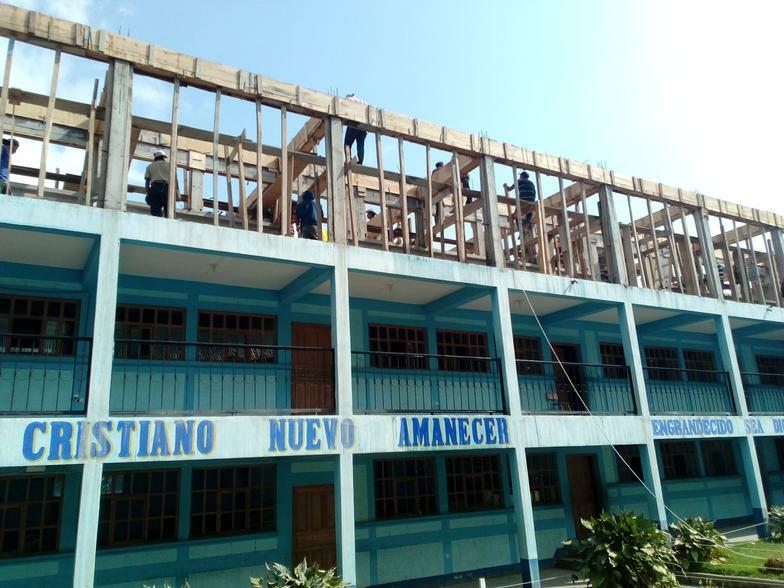 Thanks to the work of three volunteer groups from West Virginia, Minnesota and Iowa, plus former students of the school, the walls are going up!